Plan sponsors tend to have trouble engaging participants in health savings accounts (HSAs)—educating them, getting them to participate and seeing HSAs as savings vehicles for retirement. Karin Rettger, president, Principal Resource Group, told attendees of the Plan Sponsor Council of America’s 71st Annual National Conference that there are two drivers for offering high-deductible health plans (HDHPs) paired with an HSA: reducing health plan costs and helping participants with retirement health care costs. On the positive side, she said, HDHPs cost 10% to 15% less than lower-deductible plans, and medical trends are lower in HDHPs. “They empower employees to be consumers, and shopping around for lower prices saves both the employee and employer money,” she stated. On the negative side, according to Rettger, some employees live paycheck-to-paycheck and are not prepared for higher deductibles and higher out-of-pocket costs. They fail to enroll in HSAs due to a lack of education, confusion or apathy. For funding retirement, Rettger pointed out that HSAs offer triple tax advantages: funds are contributed pre-tax, grow tax-deferred and withdrawals used for qualified medical expenses are tax-free. She noted that HSAs get FICA tax relief too, saving both the employee and employer money. “If you save $3,450 per year—the current maximum for single-coverage—in an HSA over 25 years, assuming a 5% rate of return, you would have $170,000,” Rettger said. Sara Caddy, benefits manager at Dimensional Fund Advisors (DFA), which won an Eddy Award, along with its provider HealthSavings Administrators, for HSA usage, overall participation and communication strategy, shared its recipe for success. Change relationship with HSA from a transactional one to a part of a retirement savings strategy. Caddy said when DFA did this, light bulbs went off for employees. It has been a big help in getting staff to move from DFA’s Preferred Provider Organization (PPO) plan to its HDHP. DFA offers a PPO and an HDHP with mirror networks and benefits. Premiums for the HDHP are less than for the PPO and DFA offers a discount on health insurance premiums for participation in its wellness program. Rettger added that the pricing structure has to be correct; plan sponsors shouldn’t leave that up to the insurance company. “Make the spread between options meaningful so the employee feels the financial reward of choosing the HDHP,” she said. DFA also contributes to its HSA half of the HDHP deductible to promote participation. “Employees say this is a big reason they participate in the HDHP. We do not require them to contribute to get the employer contribution, but others could do a match to promote savings from employees,” Caddy said. She pointed out to conference attendees that what employers put in reduces the amount employees can put in—the limit is a total limit for employee plus employer contributions. Rettger added that when employers question finding the budget for employer contributions, they need to remember their FICA savings and health care premiums savings. Also, for an employer that used to offer a retiree health plan and no longer does, HSA contributions can be a cheaper alternative to a retiree health plan. According to Rettger, common matching formulas include a set amount based on the tier of coverage—i.e. single, employee +1 or family—and a set amount based on a percent of the deductible. She added that timing is important, front-loading an HSA encourages participation, but most plan sponsors contribute quarterly because once an employee terminates, it’s their money. Caddy said DFA introduced a patient advocacy service to assist employees in shopping for medical services and to provide medical cost transparency. “We have saved our employees $1.2 million since 2011,” she noted. DFA also found an HSA carrier that promotes first-dollar investing, which has driven home the concept and practice of making the HSA part of a retirement strategy. Caddy explained that many carriers wait until an employee has a certain balance to allow investing of HSA assets. DFA provides HSA education upon hire, which is followed up with an email to reiterate talking points. Employees also get HSA education during open enrollment staff-wide meetings, during set office hours where people can come in and discuss the HSA one-on-one and during small group meetings. “Any time retirement is discussed, HSAs come up as well,” Caddy noted. Part of the education focuses on consumerism: A doctor may refer an employee to a certain place for an MRI, for example, but DFA reminds employees they can contact the patient advocate to see if there is a cheaper place to get it done; a doctor may prescribe a brand name medication, but employees are reminded they can use a generic version. In education, DFA reiterates what employees can use HSA funds for—COBRA premiums, long-term care insurance premiums, Medicate premiums, or for “just-in-case” expenses. 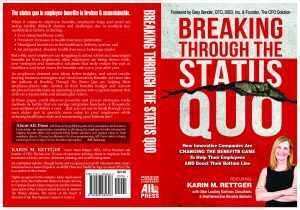 Rettger added that for education about getting tax-free income in retirement, a powerful strategy employees can use is to pay out-of-pocket costs now, save the receipts and when the employee retires, he or she can turn them in to get reimbursed for health care expenses. Rettger said DFA often details for participants worst-case scenarios by comparing PPO and HDHP cost implications. “HDHPs always get a bad rap, but if designed right, they can be less expensive than PPOs,” she said, showing an example of how HDHP premiums plus maximum out-of-pocket costs less employer contributions in an HSA could be less than premiums plus out-of-pocket costs in a PPO. Currently 87% of DFA employees are enrolled in its HDHP.